This necklace will transform “Day to night”, “Office to Special Occasion” and “Sophisticate to Edgy”. Just pull and adjust chains to your needs of the moment. 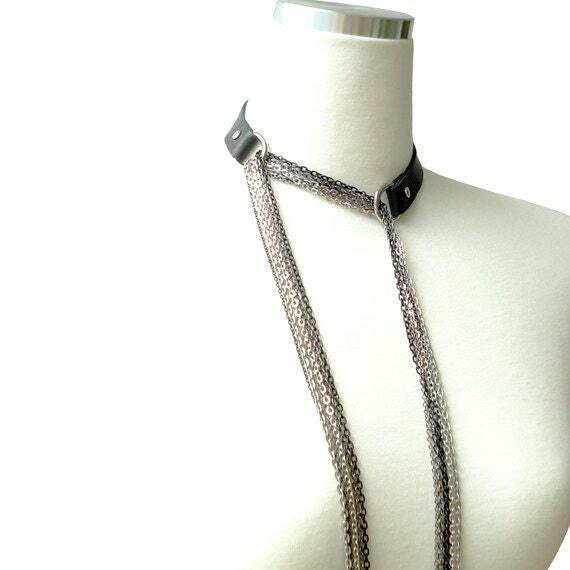 Black Genuine Lamb Leather base with Multi Strand of Chains in varies sizes and color. This necklace has been designed with no clasp as you can easily slip it over your head. Gotta love StudioHx3!!! I really appreciate that they carry unique pieces which I can't find anywhere else. And that's what makes fun to shop here or even just to browse through. I was expecting to receive my order in 10~15 days as they described but I got it in 7 days which was a very nice surprise.